Drivers use the mobile app to see their routes, track delivery completions or skips, leave notes about customers, and collect signatures. 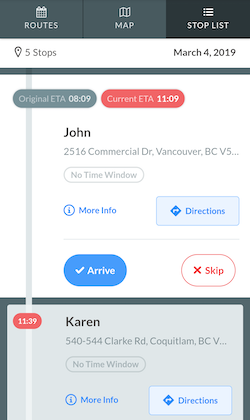 When a dispatcher publishes routes in the Routific web platform, those routes are automatically dispatched to the drivers via SMS text message. Drivers open their routes in directly in their mobile web browser by clicking the link provided, no app download necessary. Routes: A list of routes dispatched to the driver. Select a route on this list to view it in "map" and "stop list" view. Switch between routes by selecting another route. Map: A map view of the selected route. Drivers can follow routes and mark delivery progress in this view. Stop List: A list view of the selected route. Drivers can also follow routes and mark delivery progress in this view. 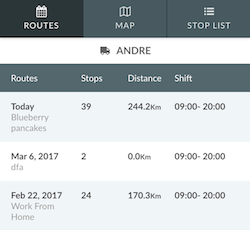 The mobile app automatically shows the next scheduled stop on the selected route in map and stop list views. Drivers can do delivery stops out of order if they need to. If you have Customer Notifications enabled, we recommend against this to ensure your notifications are as accurate as possible. Arrive - Mark a stop as complete. Skip - Mark a stop as skipped. Directions - Get turn-by-turn directions in Google Maps. This will open the Google Maps app if it's downloaded on the phone. If the app isn't downloaded, it will open Google Maps in the phone's web browser. To use a different map app, copy and paste the address. More Info - See details about this stop entered by the dispatcher. Live Tracking is a feature that allows dispatchers to monitor drivers' progress based on the actions they've taken in the mobile app. 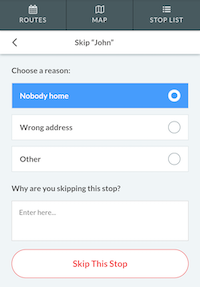 It also allows drivers to record notes about each delivery. Each time a stop is marked as complete or skipped, the route is updated for the dispatcher with the updated information from the driver. 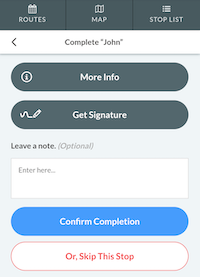 Signature Capture is a feature that allows drivers to collect signatures for each delivery inside the mobile app. Customers can sign right on the driver's phone screen. These signatures are stored in the route and can be viewed by the dispatcher in Routific. What If My Phone Loses Signal While Using the Mobile App?